I love America's Text Kitchen. I enjoy watching the Cook's Country shows on PBS and I love their recipes. The recipe testers really do an incredible job developing and perfecting recipes that are perfect for the home kitchen. I prefer and trust their recipes significantly more than I do recipes developed at the Food Network. I think America's Test Kitchen does a more thorough job really focusing on every detail and variable before coming up with their final result. You can really see this when they demo recipes on the TV show because they explain everything so well. One of their cookbooks I love the most is Comfort Food Makeovers. So far I've tried about half a dozen recipes from the book, including their Pork Lo Mein and Chicken Enchiladas among others. I haven't been disappointed by anything thus far, and I really love that the testers have tweaked recipes for some of my favorites while figuring out where to cut the fat and when to leave it in. 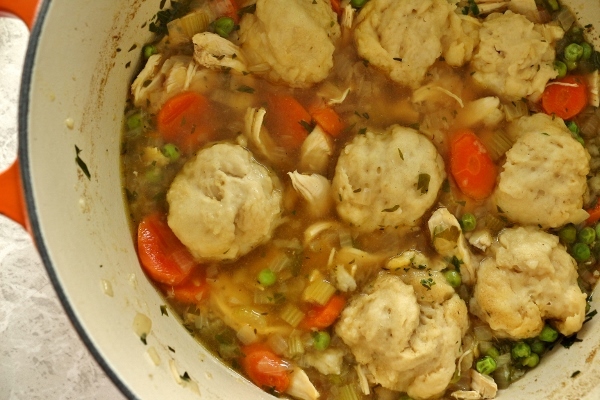 I've made the chicken and dumplings on a couple occasions, and I'm so pleased with the results. The stew itself is not thickened with a roux (this saves calories) but it develops wonderful flavor from searing the chicken with the skin on (fat equals flavor--the skin is later removed), then adding some sherry, thyme, and aromatics. 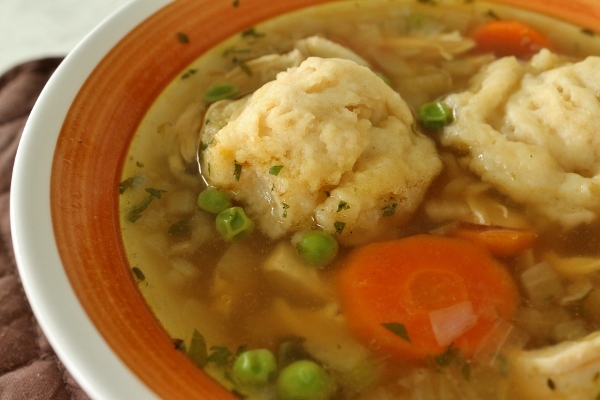 The chicken remains moist in this super chunky stew. 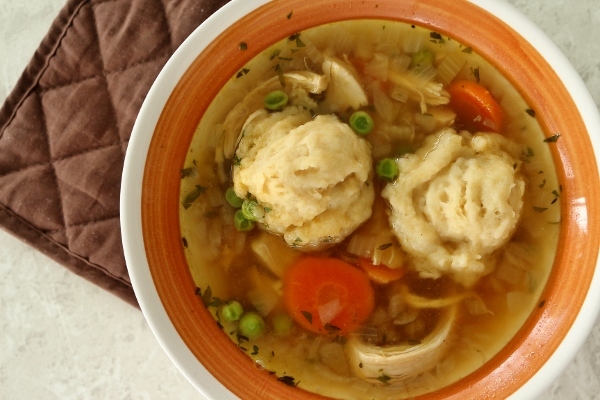 The flavorful broth is a lovely base for the dumplings, which are somewhat dense, yet tender at the same time (especially when soaking up the rich broth). 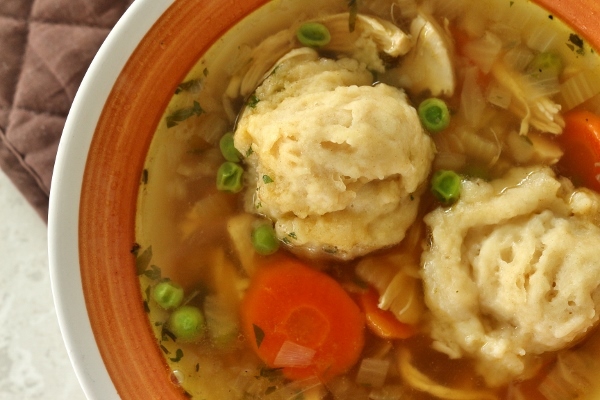 I love the balance between hearty veggies and chicken, fragrant broth, and fluffy dumplings. I'm not sure I'd ever feel the need to create a full fat version of this dish when this slim downed variation hits every note. With fall approaching quickly, dishes such as this will be in high demand! For the stew: Pat chicken dry with paper towels and season with salt and pepper. Heat oil in a large Dutch oven over medium-high heat until just smoking. Brown chicken well, 10 to 12 minutes; transfer to plate and remove skin. Add carrots, onions, celery, and 1/8 teaspoon salt to fat left in pot, cover, and cook over medium-low heat, stirring occasionally, until softened, 8 to 10 minutes. Stir in sherry, scraping up any browned bits. Add broth, thyme, and chicken and any accumulated juices. Bring to simmer, cover, and cook until chicken registers 160 degrees F, about 20 minutes. Remove pot from heat; transfer chicken to plate. When cool enough to handle, shred meat into large pieces, discarding bones. For the dumplings: Whisk flour, sugar, salt, and baking soda together in a large bowl. In separate bowl, stir chilled buttermilk and melted butter together until butter forms small clumps, then whisk in egg white. Add buttermilk mixture to flour mixture and stir with rubber spatula until just incorporated. Return stew to simmer and stir in shredded chicken, peas, and parsley. Season with salt and pepper to taste. 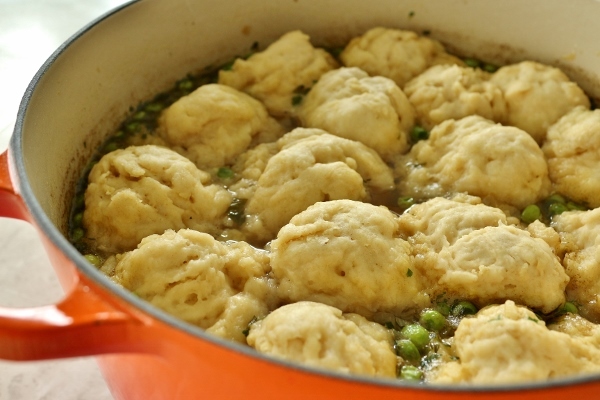 Using greased tablespoon measure, scoop and drop dumplings on top of stew about 1 inch apart. Wrap lid of Dutch oven with clean kitchen towel (keeping towel away from heat source) and cover pot (this will prevent steam droplets from dripping onto the dumplings and making them soggy). 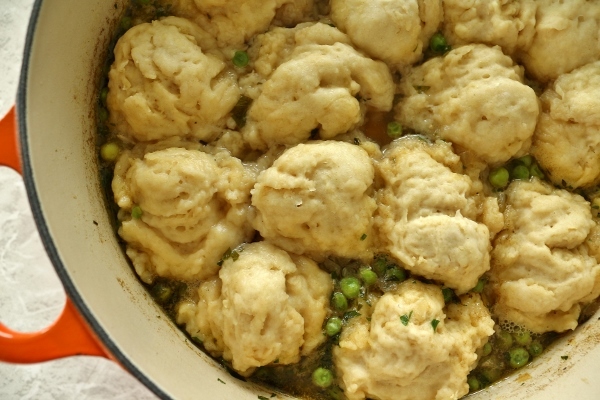 Cook over low heat until dumplings have doubled in size, 13 to 16 minutes. Serve. 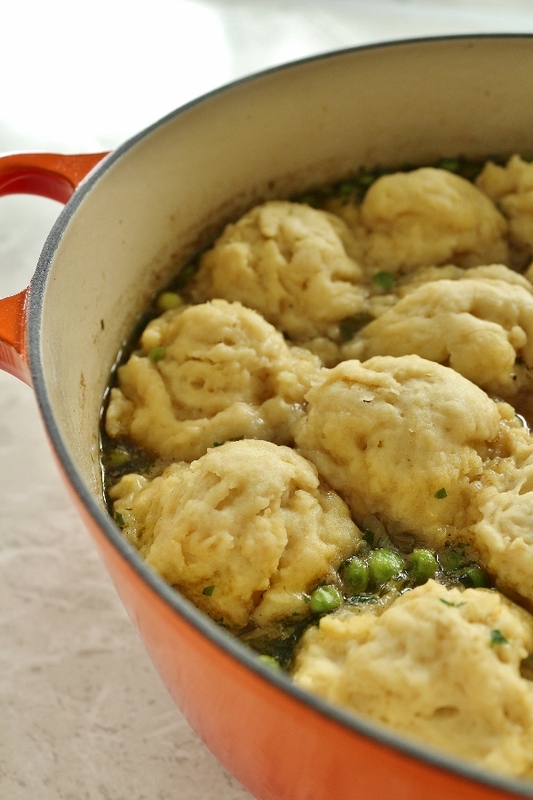 *Note* For serving, I suggest gently removing dumplings from Dutch oven and then ladling stew into individual dishes, then topping with dumplings again. 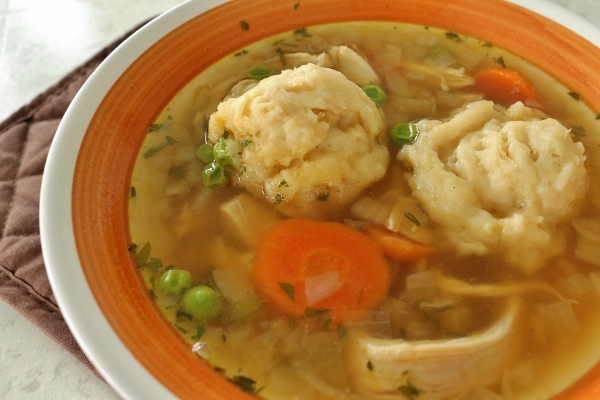 It's awkward trying to evenly distribute the stew without moving at least some of the dumplings out of the way.